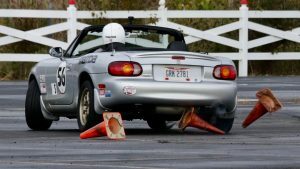 The day before we left to Europe, Cincinnati Region SCCA hosted their PE7 at Traders World. A week after we got back and finally recovered from the jet lag, they held their PE8. Can’t thank my wife enough for planning our trip perfectly in between my last two events! I didn’t do very well on PE7, finished only about mid pack out of 20 Street open entries. I was in the second heat, which ended up to be the best heat out of the worst, with at least some dry runs. This is my favorite angle of the same run by my Garmin VIRB360. I love this little camera. It connects to the OBD2 (using Bluetooth OBD2 Adapter) and get all the extra info and inlay it, and also automatically stitches the video into 360, using VIRB Edit. Camera is super easy to use, and though VIRB Edit has quite a bit of room for improvement, it’s free and does the job.